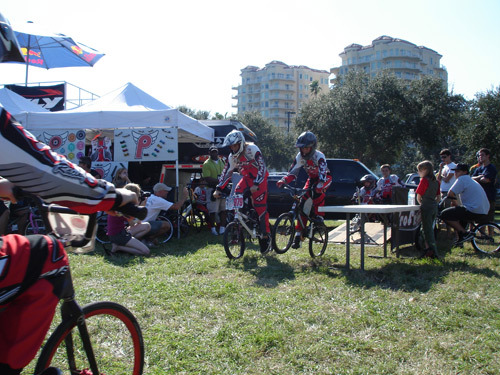 Well, it has come and gone…the 2nd annual Bicycle Bash by the Bay held today in downtown St. Petersburg, Florida. The weather couldn’t have been better — 78 degrees and sunny! 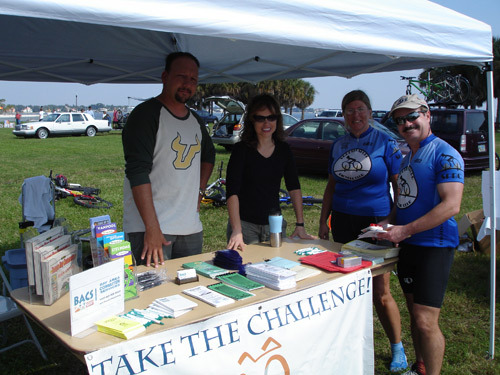 Bikecommuters.com was there to provide coverage and to spread the word about bicycle commuting in the Tampa Bay area. Come with me as I walk around the incredible Vinoy Park venue…a tour in pictures, if you will! First, a satellite view of the venue — that blue stuff to the right of the arrow is Tampa Bay itself. 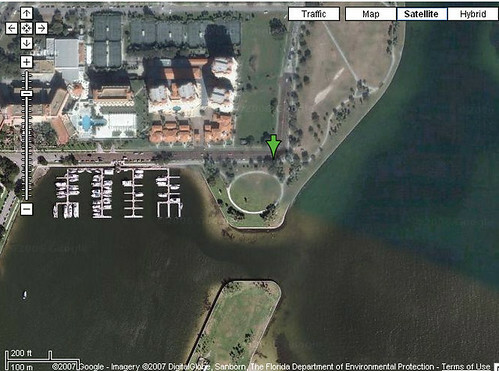 Vinoy Park is located on the north edge of downtown St. Petersburg and is RIGHT ON the water. It’s a great place for a great event! 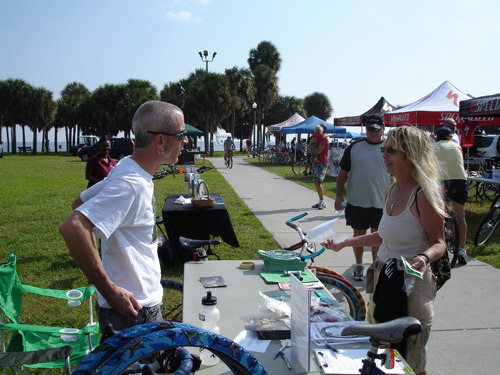 Bikecommuters.com partnered up with the Hillsborough County Metropolitan Planning Organization to distribute flyers, bike route maps, blinkies, “Share the Road” stickers and lots of other great giveaways. I recruited my good friend Terry (a fellow librarian, rocker and all-around good guy) to assist. We both had a blast meeting people and spreading the word. 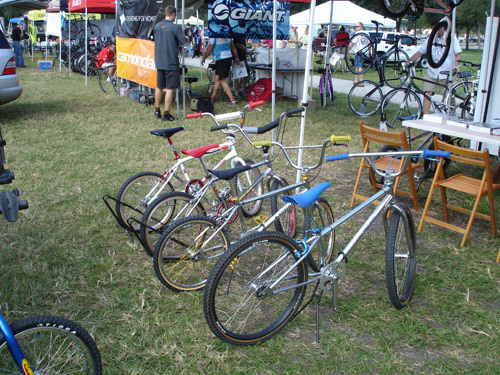 There was a fantastic vintage BMX collection on display (this is only a fraction of the full collection…I caught the guy right after he started unloading his trailer). 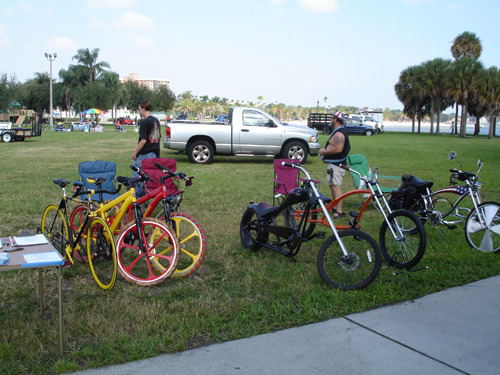 There were lots of freakbikes here, too. Many were hand-built by chopper-building extraordinaire Robert “Bullet” Ferrin. 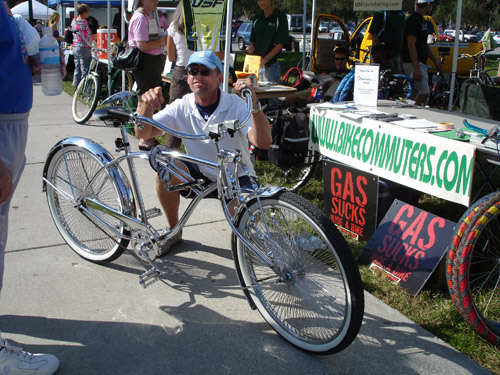 Here’s the winner of Bullet’s “$100 freakbike challenge”…this machine had the most pristine chrome on any bike I’ve ever seen! Check out this machine…a Welsh-made Newton trike. This bike’s front wheels are turned with steering rods attached to the fork’s steerer tube. It was, in my opinion, the coolest bike that stopped by the Bikecommuters.com booth! Here’s a shot of “tent city” during the height of the event. 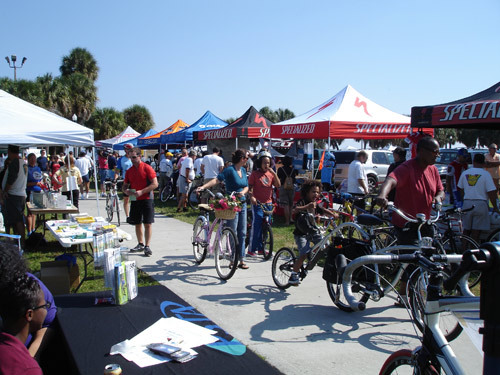 It is estimated that somewhere in the neighborhood of 3000 people came to the Bash, making it one of the largest (if not the biggest ever) bicycle-related events in the Tampa Bay area’s history. 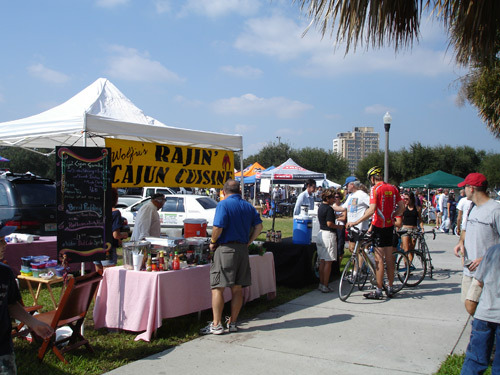 In addition to the bike shops, advocacy groups, free massages, bike and component manufacturers and others in attendance, there was also a lot of locally-made food. This tent was serving some BADASS Cajun cuisine…hot and spicy! 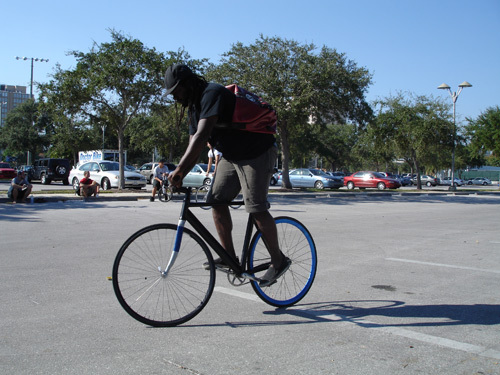 The rider was OK, but he appeared to have damaged his front wheel…he got some technical assistance from his crew before he resumed the demo. Finally, I caught the man behind this event in a quiet moment. 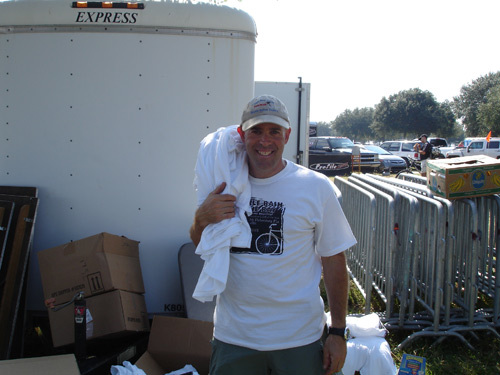 Alan Snel is our area’s dedicated champion of all things bicycle, and his hard work, relentless spirit and great personality came together to make this event a success for participants and visitors alike. Alan, take a bow — you deserve your moment in the spotlight!!! We’d like to thank Alan for inviting us to this event and getting us a table to use. We’d also like to thank the great folks from Sweetskinz for donating a few sets of tires that we are going to raffle off…those tires created quite the buzz at our booth — everyone who walked by could not resist picking them up, remarking about them and asking questions…good thing we had brochures to distribute! We’d also like to thank our friends at KHS Bicycles, who donated some goodies for us to give away and who support our advocacy efforts in many other ways. 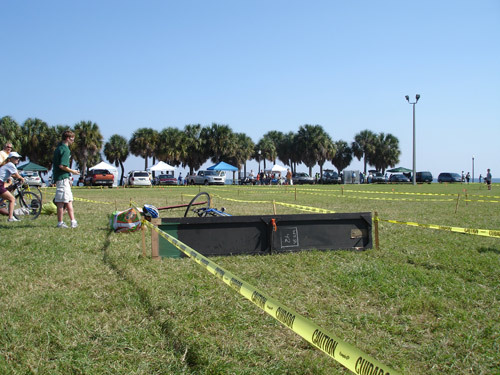 Finally, we’d like to thank the gentleman from Tampa Bay Freewheelers (sorry, buddy, I didn’t catch your name) who graciously offered us the use of a tent canopy for the event — we would have gotten a wicked sunburn without you, and we are gratefully for your group’s generosity! Wow Jack, thats one impressive event! I’m glad you had a great time. By the way, I like the sideburns! The picture of “tent city” only captures a fraction of the people who set up to display their wares…I couldn’t possibly get a good photo angle to get them all (the event was set up in a giant “V” along the sidewalk that runs through the park). This event was HUGE…a rough estimate of the vendors, advocacy groups, race teams and other participants was probably 60 or 70 tents. It was a damn good feeling to be around all those cycling enthusiasts, too. Wow. What a great turn out! That’s awesome! I love the Newton Trike – where can I get one? Follow the link in the article to Roman Road, UK. 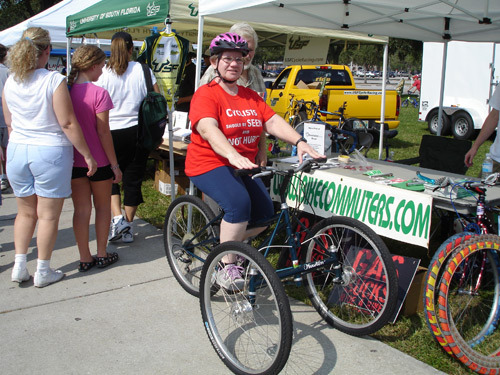 Newton Trikes are all custom-made. Pingback: The Bike Geek: Commute, Road or MTB, It's all good! Forget about the bikes, and know more about Huawei’s new Smartphone ! Plase check out our new page ! I want everyone to visit my web site !